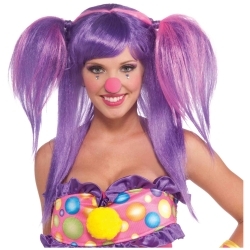 The Berry Bubbles clown wig adds a bright and colorful finishing touch to any female clown costume. Directors can use this wig for characters in "Seussical the Musical" or for the Munchkins in "The Wizard of Oz." The Berry Bubbles clown wig is colored as pictured. The wig features an elastic band for a comfortable and secure fit to almost any head size.